In 2016 Laura Wilson (b. 1983 Belfast) undertook two important residencies: at Delfina Foundation, London as part of Markets and Movements, and the third season of the impressive Politics of Food series and at Site Gallery, Sheffield. This has concentrated attention on her latest long-term research-based project, which focuses on bread, a prosaic, but metaphorically rich, foodstuff. 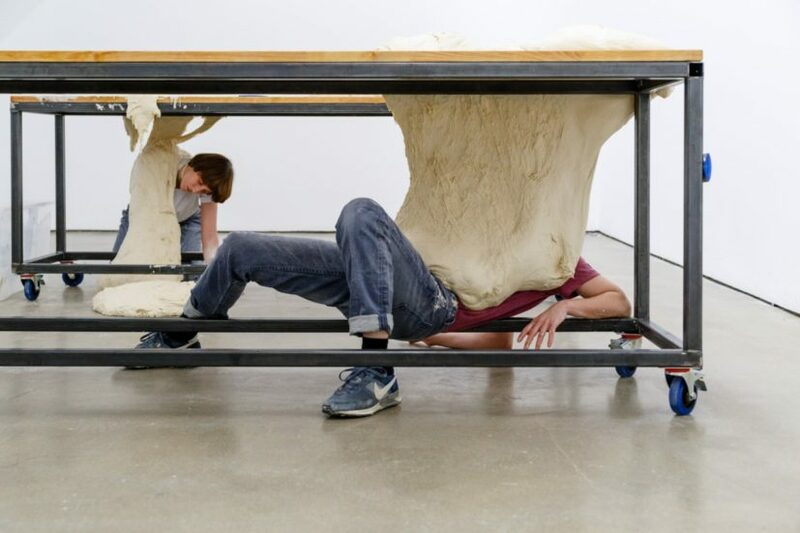 In her practice, Wilson frequently collaborates with specialists to create performative sculptural works that illuminate the relationship between materiality, memory and tacit or experiential knowledge. At Delfina Foundation she developed the project Trained on Veda, in which she sought to become the keeper of the century-old recipe of Northern Ireland’s malty Veda Bread. 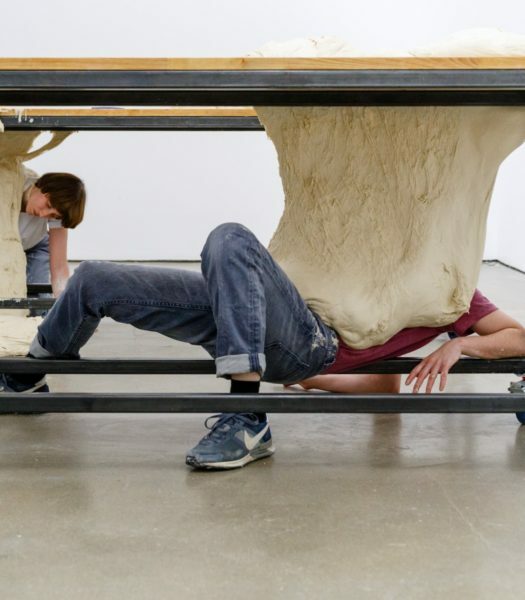 At Site Gallery she developed the intriguing performance Fold and Stretch (2016). 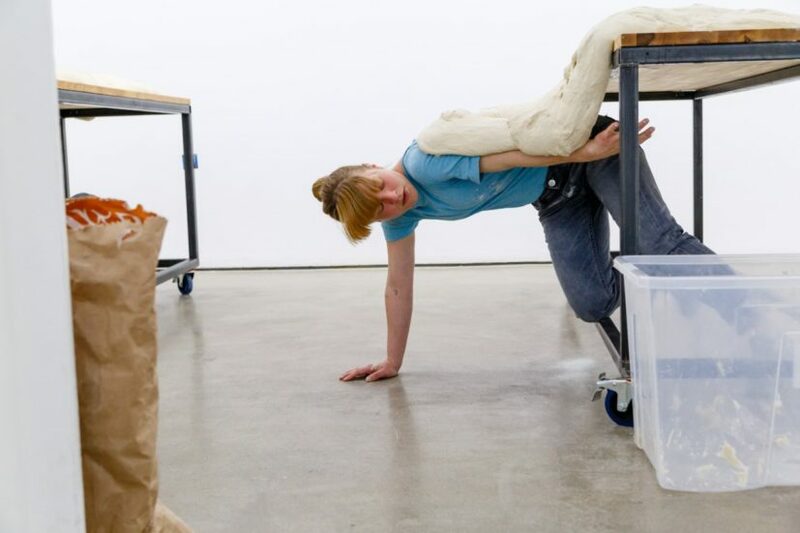 Collaborating with a baker and a choreographer, she created a work that investigated the physicality of live dough and its relationship to the body through movement and dance. 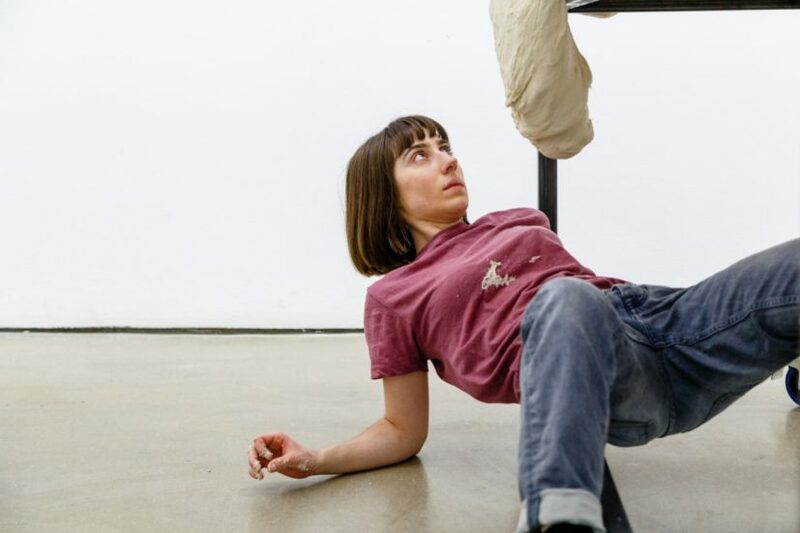 Wilson’s upcoming solo show Folds at SPACE in Hackney’s Mare Street is the culmination of her recent residency-based research. Wilson stages a life-modeling studio but with the naked body absent, replaced by a surrogate, the abject dough-blob. Lacking in skeletal support, its dead weight cannot resist gravity. The dough’s pleats evoke both classical drapery and folds of old or excessive skin. It speaks of our culture’s anxieties around the aging or obese body, the loss of control over our flesh. Bodies must be sculpted at the gym and gluten shunned. This dough faces a torso-sized lump of Bath Stone seated on a custom-made bench. On Saturdays, in front of gallery visitors, two local stonemasons will work away at this block. As the dough hardens and decays, its shape is gradually immortalised in stone. Simultaneously, the artist learns their techniques, skills that are no longer necessary to her profession and are being rendered obsolete by 3D printing technology. This public performance of the transference of traditional stone carving skills highlights the time and collaboration needed to acquire them. Such skills can’t be gained instantly via a YouTube tutorial or a phone app. The situation Wilson creates invites reflection on the passage of time, the role of art and the transmission of culture. Wilson has used raw building materials in previous research-based works, which encompass performance, sculpture, architectural intervention, video and lectures. Faced with London’s new glass-and-steel facade, Wilson investigated the traditional brick in a series of works including Brick Exchange (2007-2010) and Brick Project (2010-2016), for which she received a Winston Churchill Memorial Travel Fellowship. Meanwhile, for Black Top (2014), a commission for the Whitstable Biennial, she invited a shovel driver to add to a pile of asphalt every day for a month and filmed the graceful actions involved in asphalt production at a local aggregates factory. Wilson moved to London from her native Northern Ireland to study at Central St. Martins, where she has lived and worked ever since. Recent exhibitions include Politics of Food 3, Delfina Foundation (2016); Fold and Stretch, Site Gallery, Sheffield, UK (2016); Brick Project at RIBA, London, UK (2016); Black Top, Whitstable Biennale 2014, Whitstable, UK (2014); and Pattern for a Dark Lantern, for Café Curio at Camden Arts Centre, London, UK (2013). She is currently a Syllabus II artist.